I don’t discuss politics on social media. In fact last year I greatly reduced my social media consumption to avoid the proliferation of content that began to dominate it. 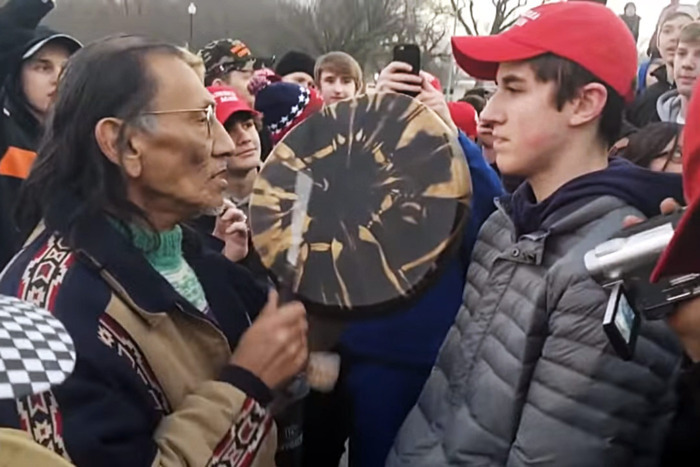 I’ve watched as the timeline of commentary has unfolded around the Covington Catholic controversy and have noticed how it has affected my thinking. Sure I’m already in a bubble based on my circle of friends and those I follow that help shape my thinking and reinforce my feelings but this situation felt a different as the story began to unfold. It has made me question both my assumptions and comfort level of continuing to consume blindly in my feed both from individuals and other trusted outlets. Today I came across an article by Andrew Sullivan that I discuss below that struck me in a more general way around how I feel my circle, and in turn myself, feel like we’re just on autopilot now finding the negative to continue to justify our thinking while ignoring context, analysis, and many other factors simply to continue weaving the narrative that we’ve become comfortable with. After reading the article I was going to just let my thoughts stay with me but then I realized that I had committed to myself at the beginning of the year to write more and in doing so shared that one of the things that has held me back has been fear. When the initial coverage and subsequent reaction to the Covington story broke I saw the outrage. It seemed so easy to condemn what happened and vilify the kids for their actions. I saw countless posts on social media each showing a greater level of disgust than the last. Then a few days later I came across this article by Julie Irwin Zimmerman which discussed a longer version of the video that told much more of this story and brought a new light to the situation. She too had reacted with indignation at the initial reports of the incident but then as she learned more, realized it was more complicated and not as cut and dry as it first appeared. So that brings me back to the article I read today by Andrew Sullivan titled The Abyss of Hate vs. Hate. In it he puts a spotlight on how the media downplayed the other aspects of the full event. “To put it bluntly: They were 16-year-olds subjected to verbal racist assault by grown men; and then the kids were accused of being bigots. It just beggars belief that the same liberals who fret about “micro-aggressions” for 20-somethings were able to see 16-year-olds absorbing the worst racist garbage from religious bigots … and then express the desire to punch the kids in the face. Andrew goes on to cite several instances of the media’s skewed coverage of the incident. I then found the following sentiment eye-opening as well. This situation was very complicated with so many perspectives and I simply wanted to share my thoughts on just how social media and the circles we form really influence us and that isn’t always a good thing. I also felt that the news media did a disservice during this event helping stoke the angry fires without all the facts and knowing the full story. It’s important to try and keep an open mind and continue having a curiosity to question what we see and hear. It’s easy and lazy to be quick to judge and leave the thinking to others as we scroll, tap, like, click, share and all the other gestures that are so easy and automatic for us in this age of social media. I am taking what has transpired as something I will learn from and modify my behavior as a result. I’ve felt continuously negative emotions over the last year around politics. This situation made me think that I don’t want to continue to wallow and fuel those emotions. It’s important for me to continue keeping an open mind and not be driven by the narrow-thinking that continues to propel on both sides of the political landscape. I also like the perspective that Joe Rogan brought to this situation contained in the quote I pulled below from his talk with Bari Weiss. Full video can be viewed here. I also came across this video by the Washington Post which provides a summary capsule of the events that transpired with several interviews that is worth watching.